DVD Synopsis: Nominated for 5 Academy Awards including Best Original Screenplay, this magical comedy met overwhelming acclaim nationwide! A painfully shy waitress working at a Paris café, Amélie makes a surprising discovery and sees her life drastically changed for the better! 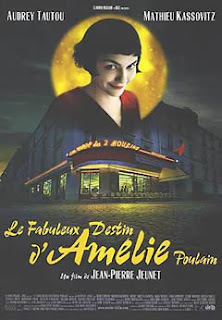 From then on, Amélie dedicates herself to helping others find happiness...in the most delightfully unexpected ways! But will she have the courage to do for herself what she has done for others? Amelie is the perfect incantation of every happy thought, moment or situation you could ever dream possible. It is a work of art, an explosion of style that owes a great deal to the technical inventiveness and high-spirited approach that director Jean-Pierre Jeunet brings to the film. The cinematography is radiant; some of what is on-screen is jaw-droppingly brilliant, with the camera moving in ways I had not seen before. In one scene, Amelie is skipping stones at St. Martin’s Canal. The camera begins from above and behind, slowly moving overhead and then down in front, all the time keeping Amelie as the central image. Finally, it stops just above the canal, as if floating on the water, and Amelie throws a stone that skips right past. It is truly an amazing visual moment, yet its just one of many. In fact, every scene is beautiful, and I waited with a sort of anxious energy for the payoff of each one. I was absolutely blown away by Amelie, and could sit down and watch it again right now. I recently re-watched Amelie and was amazed at what a beautiful movie this is in all regards. I couldn't agree more with your review - and it certainly is re-watchable! @Klaus: Amelie really is a movie I could pop in at any time and enjoy. It's the textbook definition of a "feel good" movie.